MindTracker and WujiBrainwave apps – Welcome to one of the coolest ways to peer into your most powerful organ… your brain! 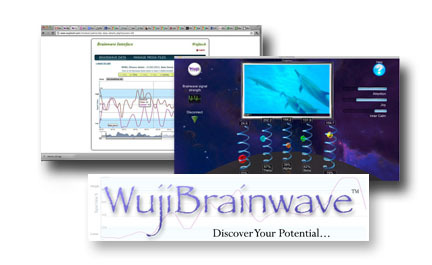 The WujiBrainwave solution is a unique personal brainwave biofeedback system, enabled thru a mobile and cloud-based app that runs on the iPad, Mac and PC. It provides insight into an individual’s state of mind by capturing raw brainwave data and presenting the output real time utilizing animated 3D feedback. Results are stored in a database to enable analysis and trending over time. 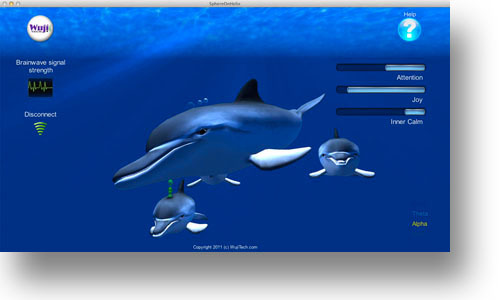 Patented 3D learning games, visually displayed algorithms, and our programmable MindMedia make this application user friendly, highly interactive and appealing to engage with. MindTracker is our newest app designed and optimized specifically for the iPhone. It is a streamlined version of the WujiBrainwave that is ideal for mobile applications and focuses on our three, Patented brainwave algorithms for Joy, Attention, and Inner Calm. Like the WujiBrainwave app, all data is encrypted and securely sent to a User's private account for access through their personal, password-protected dashboard. An amazing array of data is available to view, analyze, and track over time to monitor your personal progress. Access is through an annual Premium Membership whick gives you full access to all our supported platforms for a single price. Click here to purchase Premium Membership for yourself. NEW FEATURE: Performance Tracking - graphically view your brainwave feedback improvement over time. tremendous traction including tracking fatigue, evaluating stress levels, academic peak performance, and monitoring levels of satisfaction..
"This app performs extremely well, and exceeds my expectations. Since I have been working with the WujiBrainwave application, I have been favorably surprised with the features provided. The recorded sessions allow for in-depth analyses of one's brainwave patterns, the associated frequencies (Delta, Theta, Alpha, Beta and Gamma), and the different mental or "mind" states (focus, joy, calm, Schumann Resonance, etc...). I tell you the results can be VERY revealing!! You can see how long each frequency remains statistically significant above a graphed threshold AS YOU ARE RECORDING, AND in dynamic chart form once the session is saved. Very powerful!! I have been interested in brainwave analysis for over thirty years and my conclusion is that WujiTech is doing things right!! They are leading the effort toward the betterment of humankind in a way that promotes effective introspection, personal knowledge and self-awareness. FIVE STARS!!!!! Thanks!! E.C./KY"
The WujiDashboard is the intelligent back-end software for managing WujiBrainwave sessions and provides a highly personalized “dashboard” environment to display an array of pertinent data for the user and insight to predictive patterns and trends.